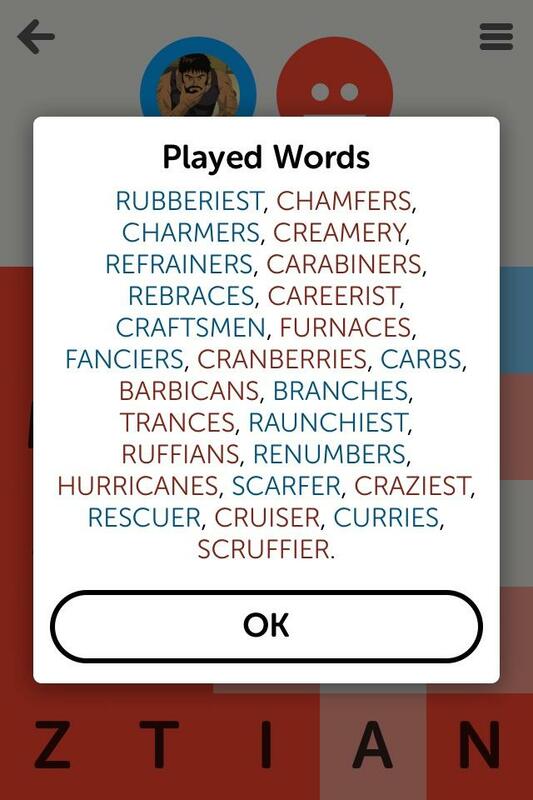 I never played Words with Friends , or Scrabulous before it, so Letterpress was my introduction to the genre of “asynchronous video games based on coming up with longer and/or more obscure words than your friends”. Which turns out to be a pleasant enough genre! Especially since my stock of long and obscure words is not small. 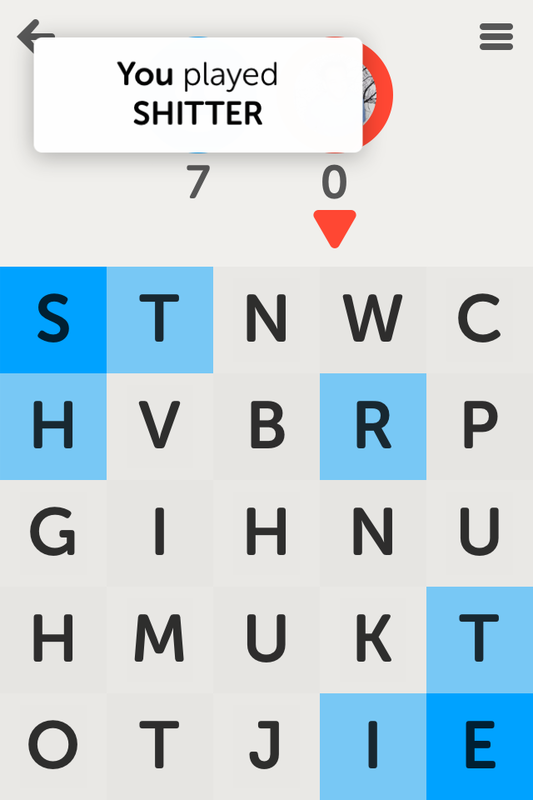 Of course, that’s a double-edged sword: I won most of my early games of Letterpress, which was boring, but Dan Schmidt clearly had the edge on me, which was also boring. So: is it just a game of “who has the bigger dictionary”? 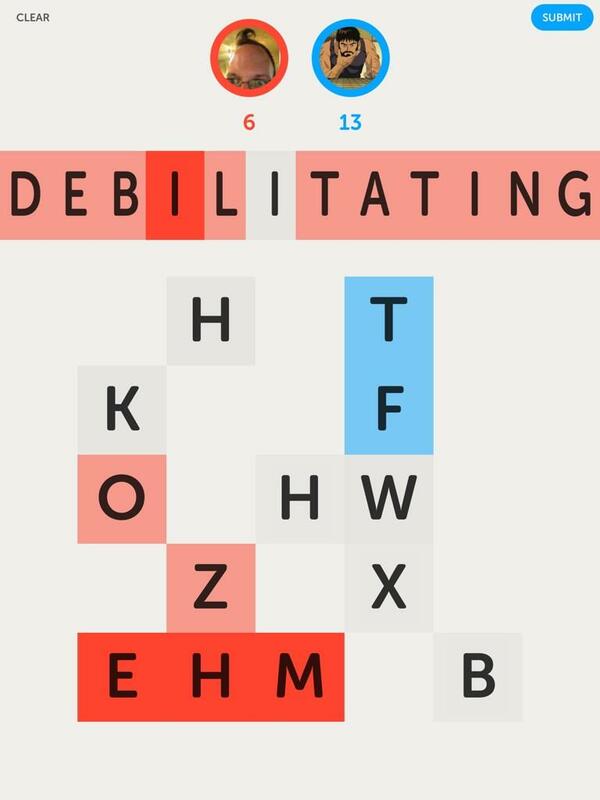 Which I was especially worried about when I encountered boards with Q but no U: I don’t want to have to memorize lists of special-case Scrabble words. 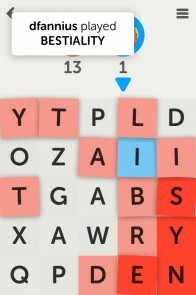 That game against Dan actually suggested that the answer might be that no, vocabulary alone isn’t decisive. 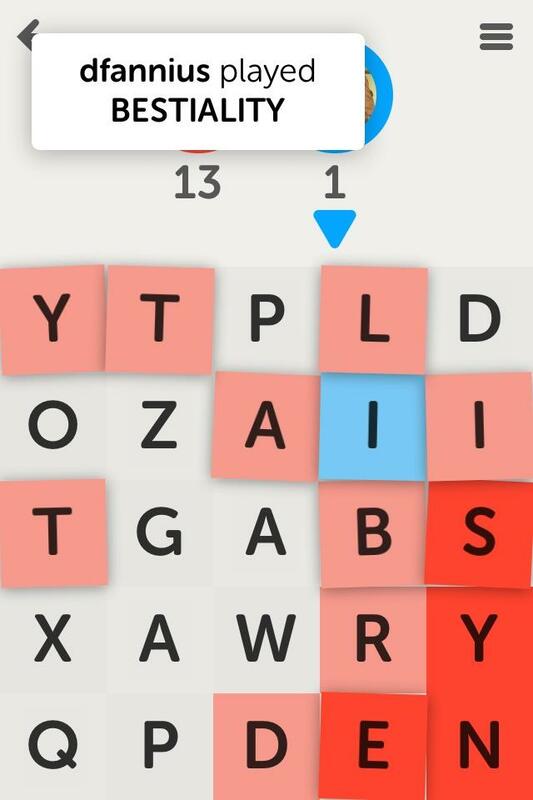 Because it went on for a long time, with us fighting over the same set of letters, and with him winning by locking down one more letter every round or two. So territory control seemed important. That also got me noticing some of the other gamier aspects of Letterpress . My initial take was that the start of the game was badly done, because the first move seemed like a dominating advantage. But the swings in points from turn to turn are quite large in general: if you, say, steal six of your opponent’s squares and grab one new square, then that’s a 13-point swing, and there are only 25 points available! So sure, you’ll have a big lead after the first move; but in the second move, the second player will take a big lead back, and the pendulum will keep on swinging back and forth. In fact, those big swings continue until the end of the game. The final move generally isn’t quite as large as the previous moves, because it will grab at least one and frequently three or four unclaimed squares (which give one point but don’t take away one point, so are only half the point swing of a play on your opponent’s boundary), and because the last unclaimed squares are generally for letters that are hard to use, hence (perhaps) lending themselves less well to long words. But still: you absolutely can’t get cocky about doing better than your opponent, having larger leads after your turn than they do after their turn, because all they need is to come up with a word that can end the game while giving them a one-point lead. So: to play well, you need to do a little bit of reading ahead. Not elaborate reading ahead, but once you get past the opening, you have to ask yourself about every word you’re considering: will my opponent be able to make a word that uses up all of the white squares that I’m leaving on the board? And, if so, will that be a winning move? If so, you’d better do something else. That’s one way in which you have to think beyond playing the word that will give you the largest point swing. 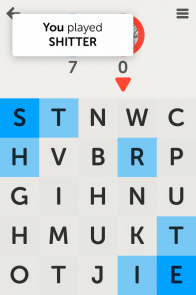 But there’s also the territory control aspect of the game: your letters that are surrounded by your own color can’t be (immediately) taken away by the other player. So if you can play in a way that takes advantage of that fact, you’ll do well. Honestly, I haven’t thoroughly analyzed the strategy there. Presumably it’s good to expose a small attack surface area: so start from a corner, expand in a clump, so your boundary is as small a proportion of your total area as possible? And the general wisdom seems to be that it’s a good idea to lock up key rare letters, e.g. vowels; of course, if you own those, then you’ll have to play them yourself, so you’ll end up not gaining territory by playing them, but it’s still better to own them than not, and given that, you can’t affect how the score will change when you play them but you can affect how the score will change when your opponent plays them. So yeah: locking up key rare letters is good. 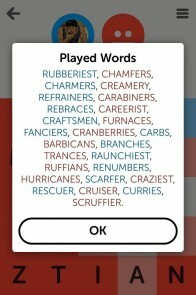 So, once I’d gotten past my first round of days, my gameplay switched from grabbing as many letters as possible wherever they were to locking down a core region and slowly expanding out from it. Games took longer; we’d end up dancing around the last three or four letters, until enough one-point gains accumulated that one or the other of us had enough of a lead to let the other player finish off the white squares. If I wanted to further improve my skills, the next thing to do would be to combine these notions of reading ahead and territory control and start trying to visualize exactly what options each move of mine would leave for my opponent. But, for better or worse, I stopped playing after about a week. If I want to play a game involving reading and territory control, I should start visiting the local go club again. 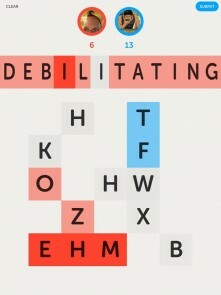 And Letterpress is fun as a social experience, but it’s too one-sided: it’s no fun to have the same person always win. I’m still not convinced that there isn’t more to Letterpress than I’m giving it—if I had more free time (or less aversion to asynchronous interrupts), I’d have pushed it farther. And I’m glad I spent the time with it that I did: it has a lovely aesthetic and some interesting ideas. (I’m not against playing it even now; I’m davidcarlton on Game Center.) But my time constraints are what they are, and there are so many good games to play this year.